Have you just tried updating your sender name in Gmail and found that no matter what you do, Outlook for mac continues to send using the old name? Have you tested in Gmail web client and it works there? Let me (hopefully) save you some time! So the fix is simple. When setting up the account in Outlook for Mac you should see a “Not Google?” link the top right corner after you have entered your email address. If you click this you can select “IMAP/POP” from the provider type selection and manually enter the IMAP and SMTP details which you can find here: https://support.google.com/mail/answer/7126229?hl=en. That’s all there is to it. You should find that your sender name is now correct. You’re welcome! 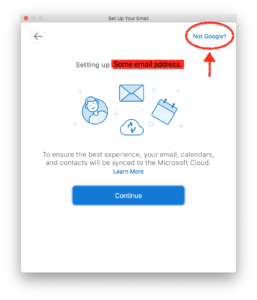 You may find you have to manually set your root folder path in the advanced settings of the account, in order to get rid of the [GMail] folder that appears when using over IMAP. You can find out how to do that here. This would be a pretty small blog post without explaining what happened to me. Few will ever visit this post and fewer still will ever read this very long and most likely badly written story, but hopefully I drop enough keywords that this get’s a decent SEO score so people can find the fix and you can avoid the same perils I went through. I started by changing the sender names and waiting 24 hours for propagation, that clearly didn’t work otherwise I wouldn’t be writing this 4 days later. A quick chat with Google support told us that it should have worked, but there’s a few other places in their million web portal system that may need to be changed, so we dutifully changed those and waited the prescribed 24 hours once again. Of course that didn’t work either and we tried everything thinking it was a caching issue from new Outlook profiles to setting things up in a clean Virtual Machine to make sure there was no legacy data hanging around on our systems causing issues. Back to Google support and it’s the usual first line support dance of repeating the issues and suggested fixes. By this point the support member was stumped and wanted to call me and screen share so he could better understand. Fast forward 20 minutes of shouting into the microphone (because volume is the way to fix an unstable connection obviously) and our support person had no clue what the issue was, what to try next or even who he could escalate the issue too. After some awkward silence I threw him a bone and suggested the good old delete and re-setup of the account. He agreed that was a logical step and ended the call. That evening (had to do things after 6PM so as not to interrupt my client’s business hours) I set up a temporary inbox to migrate the email data into. Started the migration then waited, and waited, and waited. 1am rolls around and at 99% complete I see lots of migration errors. Check the inboxes and there’s lots of emails missing from the temporary inbox, so I had to bail out as there wasn’t enough time to try again. The following day I re-start the initial migration during the day, by 6PM it’s complete, so I delete the original user and re-setup. It’s at this point I really get frustrated. Outlook uses oAuth to access GMail, and for some odd reason it keeps logging me into the now deleted account. To this day I have no idea how that’s happening, but after clearing everything I could and using a private browser tab to go through the oAuth process it finally logs me into the new account. Before migrating the data and dusting my hands of the whole ordeal I send a test email… It’s still using the incorrect name! How is this even possible?! I migrate the data back anyway as the user needs their email account in the morning but by this point i’m out of ideas. The following morning I wake up with an epiphany. Let’s put Outlook into offline mode and check the email headers before and after sending. 2 minutes later i’ve confirmed that whilst sitting in the Outbox the From header is correct and it’s only once the email has passed through Google’s SMTP servers and landed in the Sent folder that it’s incorrect. I have no idea why this only happens with Outlook but I surmise that there are different SMTP server pools depending on the source client and there must be a propagation issue somewhere. Back to Google support for the last time. This team member assures me he has seen this problem many times before and knows exactly how to fix it. Spoiler alert: He barely understood the issue and had no idea what a “From email header” was so ignored that vital piece of information. He went through the process of deleting address book entries, and then sending me google search results suggesting I try all of the things he finds, as if I’ve not already been through the first 100 pages of results for every conceivable search phrase. He finally gives up on that and then starts along the line of Outlook being an unsupported client hoping to get out of it. I re-explain the From email header evidence, he’s still not sure what I mean but I guess he figured I wasn’t having the unsupported client excuse and eventually said he’d escalate me to an email specialist (it only took 4 days). No one’s available so he takes my phone number with a promise of a callback in 24 hours. My client says one of the users can’t connect. I remember I need to re-authenticate them since it uses oAuth rather than plain credentials. Using a remote support connection I delete and re-add their GMail account to Outlook, but it also keeps logging me into the deleted account for some reason. Clearing caches and private browsing doesn’t solve it this time and i’m at a loss. What else can I do?! In a last ditch attempt I tap the “Not Google?” link in the setup wizard and enter the server settings manually. It still sends me through the oAuth process so I don’t expect it too work. But then, as if by magic the account starts downloading the email inbox for that day. Hurray! I send a test email to check it’s all working before logging out and notice something… The email came through with the correct name! I fixed it! As of writing i’m still waiting for that specialist to call me back. I assume theres a sync issue with whatever Gmail plugin Outlook uses. I also expect the specialist won’t try and find a resolution or file a bug report for that once they find out I’ve worked around it. So if you’re reading this, then I guess my expectations are correct.